Sir Alex Ferguson insists Hampden's history of staging European finals makes it an ideal venue for matches in the 2020 European Championships. On Friday, Uefa will select the 13 host cities for the tournament and Glasgow joins the likes of London, Cardiff and Dublin among the candidates. "Everyone involved in the decision making only has to look back at the six finals [held at Hampden]," said former Manchester United manager Ferguson. "The clubs will have fond memories." 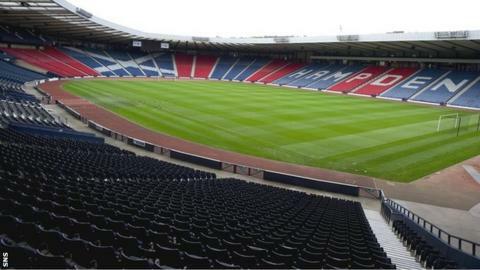 Hampden - home to Queen's Park - staged the 1960 European Cup final, in which Real Madrid beat Eintracht Frankfurt 7-3. Ferguson attended that game. "I went along there thinking that Eintracht Frankfurt were gods," the former Aberdeen and Scotland manager told the Scottish Football Association. "They beat Rangers in the semi-final 6-3 at Ibrox Park, which was unthinkable, but Real Madrid splattered them 7-3. The atmosphere was unbelievable, with 133,000 people there. "There was a documentary recently on [former Real Madrid forward Alfredo] Di Stefano where he spoke about his five finals, and he made a special reference to the people in Glasgow and the atmosphere in the stadium. "The great point he made was two players scored seven goals - he scored a hat-trick and Ferenc Puskas scored four. He makes special reference to that night. That's a great basis for thinking about how special Hampden Park is for a final." The stadium also hosted the European Cup Winners' Cup finals of 1962 and 1966 and the European Cup final a decade later, which was won by Bayern Munich. There was a long gap before the redeveloped stadium held the 2002 Champions League final, remembered fondly for Zinedine Zidane's spectacular volley for Real Madrid in a 2-1 win over Bayer Leverkusen. And seven years ago Spanish sides Espanyol and Sevilla contested the Uefa Cup final on Glasgow's south side. Ferguson believes his home city's reputation for affording a friendly welcome to visitors should also boost Hampden's chances. "I've always felt that when I return there's an eternal friendship in Glasgow," he said. "It doesn't change. What we were talking about in 1960 remains to this very day. "They have the great ability to communicate with people and make them feel welcome. "They have this fantastic affection for the game. Scotland is a football nation, no question about that." Cardiff's Millennium Stadium and the Aviva Stadium have been proposed as venues, while Wembley could host the final.